I have been trying to get a good looking shaded relief model out of GRASS and Qgis for a day or so now and just can't seem to get it. The biggest problem I'm having is the valleys look like mountains, but I just can't seem to get the right combination in order to show mountains and valleys look right. Problem: Hills look good but the river (in red) still looks like a mountain even though it's the lowest point on the map. 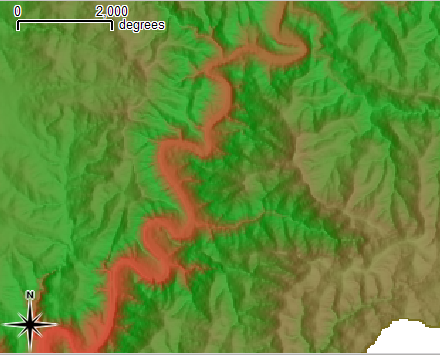 Problem: Again the hills look good but the river (in red) still looks like a mountain even though it's the lowest point on the map. I have tried all different combinations of angles and sun heights and I just can't seem to get the river to look like a river, it always looks like a hill. Can anyone point me in the right direction on what I might be doing wrong? This looks much better to me, not the greatest colours but we can change that. I think my work install of grass must be busted because even the defaults looked bad. For my perception the valley looks ok in this example. 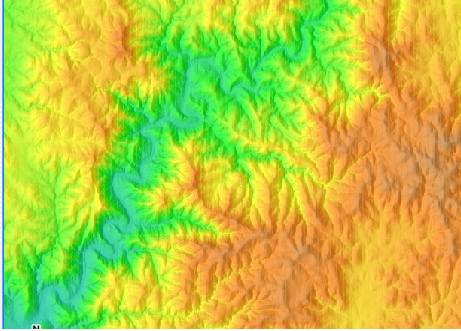 The colortable comes from r.colors (there are "terrain" and "srtm", see here for examples of these color tables). The software might be using radians instead of degrees. The angle might be measured counterclockwise from due east (the math/physics convention). On first glance, it seems like the color ramping used is what makes the data look particularly confusing, choosing an appropriate hypsometric tint would make the differences more obvious. You may also want to look at other pre-generated shaded relief datasets for comparison, such as this SRTM-based one. 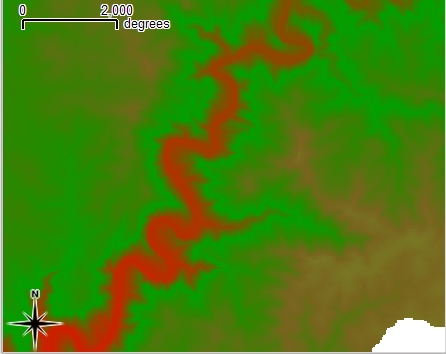 Another thing that would likely help is to add a stream centerline in an obvious water color, this will make unambiguous which areas are low-lying on the map and prevent the optical trick which makes the river appear as a ridgeline. You may want to also check out Tim Sutton's guide to making shaded relief DEMs using GDAL for some helpful advice and techniques using only command-line tools. 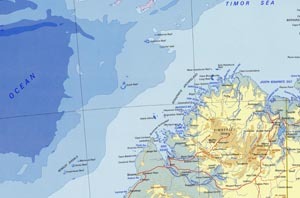 It is based on the convention that an imaginary light source (eg the Sun) is in the northwest corner of the map and the shadows spread out towards the southeast corner. Not the answer you're looking for? Browse other questions tagged qgis dem grass hillshade shaded-relief or ask your own question. 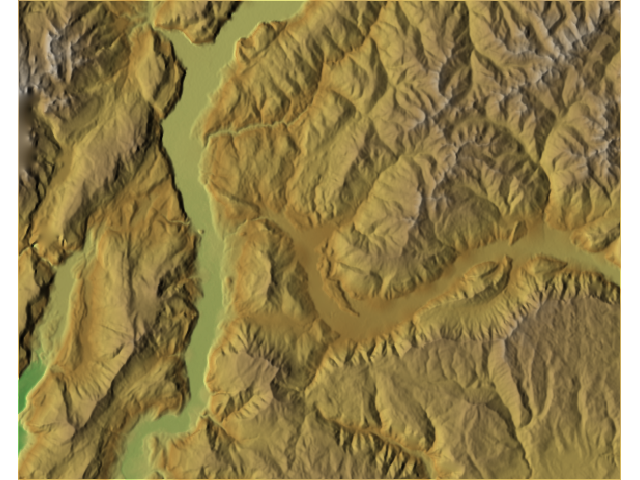 Combining high resolution and generalized hillshade rasters to produce enhanced shaded relief? How to remove parallel stripes from DEM in QGIS or GRASS? Cropping raster and merge it to overlapping DEM?